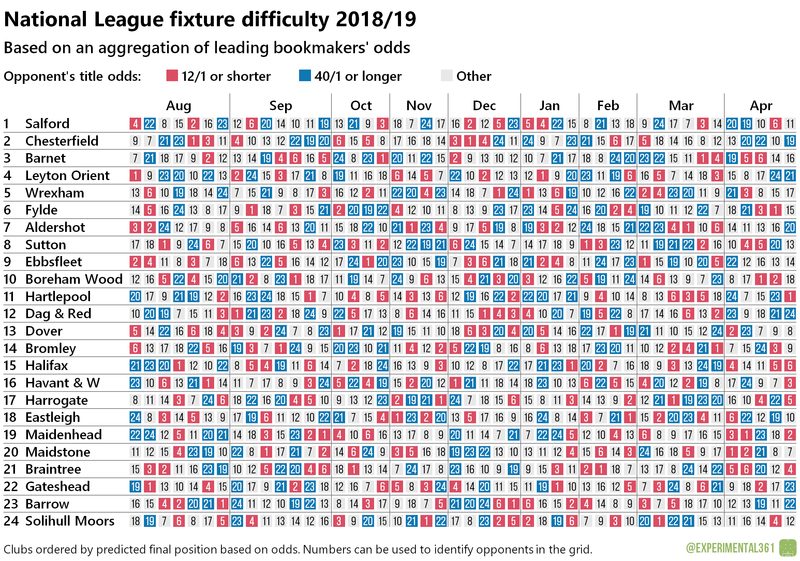 As usual, I’ve taken the newly-released National League fixtures and combined them with an aggregation of leading bookmakers’ odds (from OddsChecker) to visualise where each club’s tough and easy matches appear to be next season. 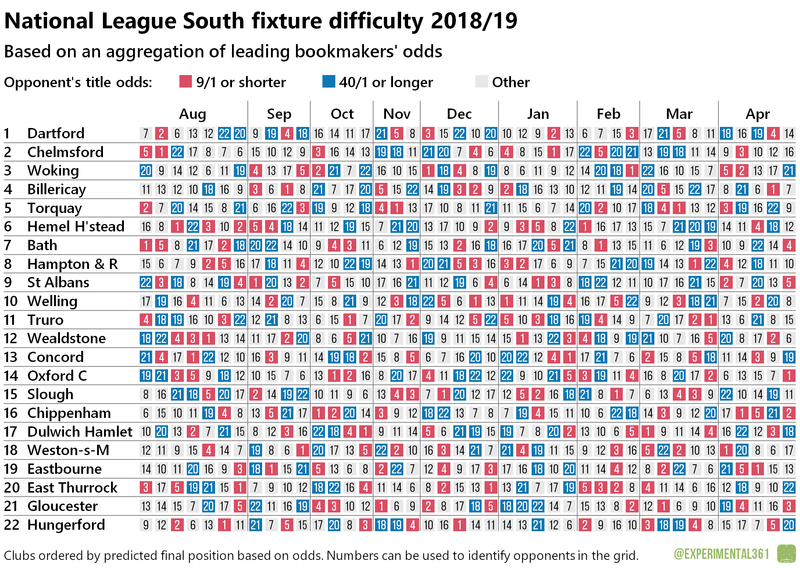 Each row in the matrix below lists a club’s league matches in chronological order, colour-coded based on how difficult they appear to be and the clubs themselves are sorted and numbered by where the odds imply they’ll finish in the table. For the National League I’ve coloured the six strongest-looking clubs (based purely on the odds) in red and the six weakest-looking in blue, and for the slightly smaller North and South divisions I’ve gone with the top and bottom five. This gave the best balance overall, but it’s worth flagging that there’s still plenty of variation among the remaining “grey” teams and a few of them will be fairly close to a red or a blue, but I had to draw the line somewhere. You can use the numbers down the side to identify which fixtures are which and I’ve provided some illustrative observations for each grid. Chesterfield will have tested themselves against their three toughest opponents by early September and meet them all again during the festive period. The Spireites finish with a straightforward-looking run-in that ends with three expected relegation battlers in their final four fixtures. 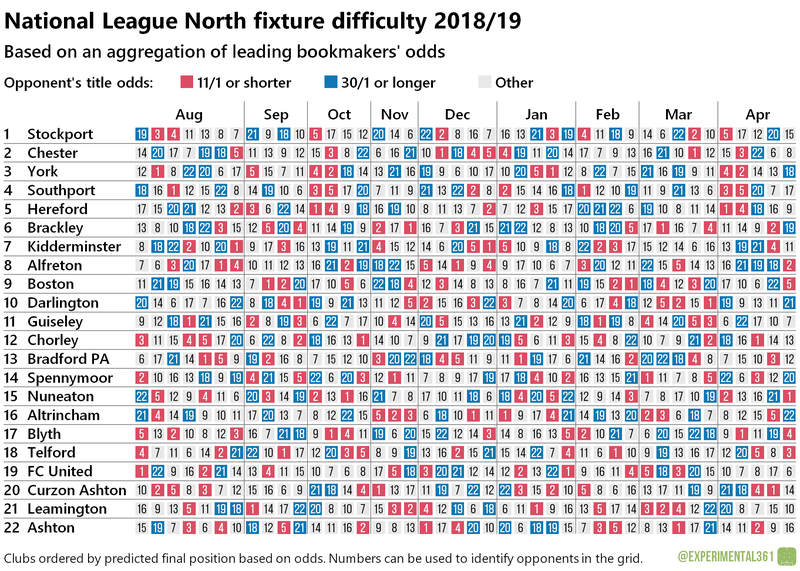 Fylde could start slowly with only one “easy” fixture before the end of September, but could then go on a bit of a run as they face four probable relegation battlers in five games. Ebbsfleet also have a tough start, with four games against likely promotion challengers before they have their first “blue” match in mid-September. Meanwhile both Hartlepool and Dag & Red will get right to the end of August before having to deal with their first “red” game. Halifax could start well with their first three games all coming against teams expected to struggle, although a tough end to the season looks likely with three likely promotion challengers lining up against them in April. It’s worth flagging that I could only find two complete sets of prices for the North and South divisions, so if I get the chance then I’ll revisit these nearer the start of the season when more information is available and the prices have had time to move. Curzon Ashton have a tricky start to the season, facing three likely promotion contenders in their first five fixtures and not meeting a fellow relegation battler until October. Darlington have a pretty gentle introduction this season, as they don’t face one of the five toughest sides until mid-September, while Blyth go almost as long as Curzon Ashton without meeting one of the teams expected to struggle (by which time they’ll have already faced three likely promotion challengers). Hemel Hempstead have a relatively tough start as they meet all of the likely top five in their first nine games, but could finish strongly with all but one of these “red” fixtures out of the way by early February. Chippenham have a tough end to the season with three of their last four matches pitting them against sides likely to be battling for promotion.